Lowcay apartment is ideal for access to both the City of Portsmouth and the attractions of Southsea. It is in a residential street but only 0.9 miles from Fratton Station. Here you can hop on a train to London, Brighton, Winchester and Chichester. Taking the bus is the perfect way to reach the Historic Ships, Gunwharf Quays (1.7 miles) and Old Portsmouth(1.5 miles) which are all close to all transport links. Fully equipped Lowcay apartment is perfect for self catering and enjoying a night in. This ground floor apartment blends modern design with character and comfort. It is spotlessly clean and well equipped ensuring your comfort for a long or short stay. It sleeps maximum of four people and has one double and one sofa bed. This beautifully presented apartment has well a equipped kitchen, flat screen TV in the living area and a modern bathroom. There is a private off- road parking space just outside the apartment, big enough for a van or campervan. If you are bringing the family, there is Wimbledon Park Sports Center within 0.2 miles (5 minutes walk) and Portsmouth FC (1.3 miles), Clarence Parade (0.6 miles). For entertainment there is Southsea beach with its 6km promenade around 300m to the south, Old Portsmouth (a 3km walk along the seafront) has historic charm, artists' open studios and stunning views over the mouth of Portsmouth Harbour and, in the Dockyard, the famous Historic Ships, one of the biggest tourist attractions in the UK. Shoppers are well catered for. Southsea's Albert Road (0.3 miles) is the place to go for fashionable independent boutiques, craft ale pubs, wine bars and independent restaurants from many cultures. Gunwharf Quays offers a multitude of designer outlet stores, there are bargains to be had here! Commercial Road (1.3 miles) offers department stores and Cascades indoor mall, also a traditional market on Thursday, Friday and Saturday. Southsea centre offers a more refined experience with regular farmers' and craft markets. I offer remote access so we don't need to meet. However, I only live 5 minutes away and, as a professional host, am always available to help with queries regarding the property and local area. 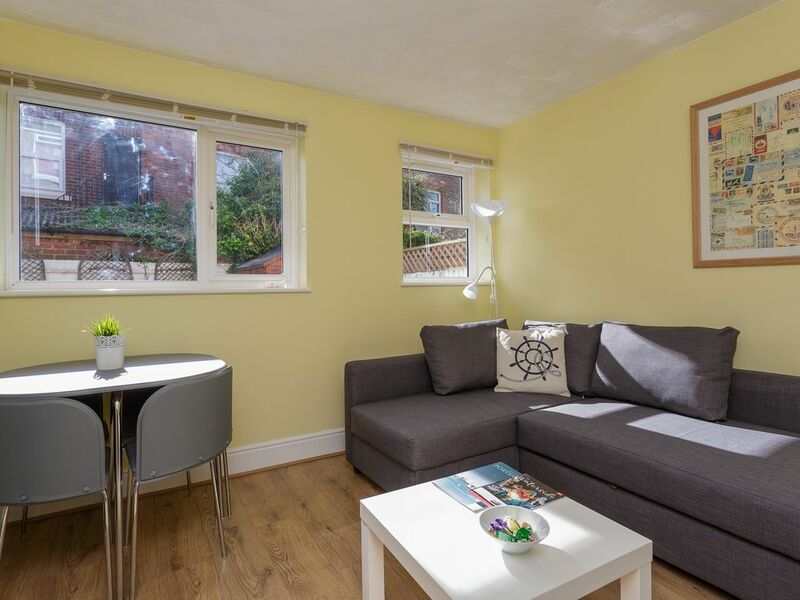 Lowcay Apartment is located in a residential street that is close to public transport links, it is ideal for visiting Portsmouth and Southsea, with easy access to all the attractions and event areas, it has off road parking space. Portsea Island including the University, Historic Ships Dockyard and ferries to the Isle of Wight and Europe are just walking distance from the Lowcay Apartment..